Together with the book 'Team 10 - in search of a Utopia of the Present' this website aspires to be the first attempt to map a comprehensive history of Team 10. At the same time, we have to admit that the ambition to produce an exhaustive historiography of Team 10 has proven quite beyond our capacities, if only because the ramified network of Team 10 forced us to make selections. Another, more practical reason concerns the archives; although the main sources were generously made available for our investigation, others still await the work needed to make them accessible for study. The most fundamental reason, however, may be that so much of the history of Team 10 consists of personal events and encounters of which no direct trace remains and which survive only in the stories that make up much of the myth of Team 10. This myth is one of the most attractive aspects of Team 10, yet at the same time the greatest obstacle in writing a history of the group of architects. One of our first objectives has therefore been to probe this myth and place the stories in a new perspective, so that forgotten connections appear and new interpretations become possible. The book falls for this purpose into three parts. The first contains a vast chronological review of the group’s meetings and other significant events. An extensive selection of project designs is used to paint a picture of the group dynamic, of the shifts in position and of the tensions between the intellectual discourse and the design practice. Secondly, new, contemporary interpretations are proffered in a series of essays, each giving a closer examination of certain questions of Team 10 history. Finally, the book concludes with a series of conversations with a number of Team 10 participants, held in the early 1990s, in which they reflect on their own past experiences. Reconstructing a history of Team 10 is not an easy matter. The group’s history challenges conventional historiography, as well as the more specific historiography of modern architecture. To draw a straight line from a clear beginning to a clear end is impossible. The picture is more like the ‘Play Brubeck’ ideogram drawn by Peter Smithson, which shows a collection of points in time and space without any obvious hierarchy, connected by a multitude of intersecting lines. There are several reasons behind this complex web of overlapping stories, including the unclear character of the group, the almost equally unclear time frame of the group’s activities and the question of the actual results of the group’s meetings. Team 10 was a loosely organized band of individuals. The composition of the group varied through the years. Such things as ‘membership’ or a ‘movement’ had no formal existence and the question of who was to be invited to each meeting invariably led to discussion and sometimes heated arguments. There was arguably an ‘inner circle’ as opposed to ‘invited participants’, but it is often hard to distinguish definitely between them. For this first attempt at a history, we have chosen to concentrate especially on the core group of the seven most active and longest-involved participants in the Team 10 discourse, namely Jaap Bakema, Georges Candilis, Giancarlo De Carlo, Aldo van Eyck, Alison and Peter Smithson and Shadrach Woods. Our aim is to bring the protagonists back together again, so to speak. Other participants and their contributions are of course also represented, particularly since it is so hard to delimitate the group as such. According to the perspective taken, the historical source and the time under consideration, one may also include José Coderch, Ralph Erskine, Amancio Guedes, Rolf Gutmann, Geir Grung, Oskar Hansen, Charles Polonyi, Brian Richards, Jerzy Soltan, Oswald Mathias Ungers, John Voelcker and Stefan Wewerka; but even this list can in no way be considered complete, considering the broad context of Team 10. Team 10 at the Free University, Berlin, 1973. 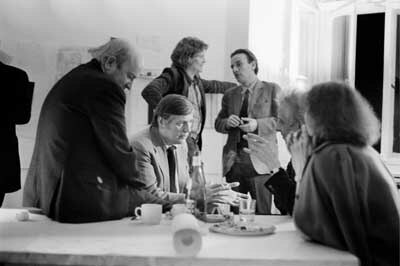 From left to right: Peter Smithson, Ungers, Schiedhelm, De Carlo, Van Eyck and Sia Bakema. Photograph by Jeffrey Scherer. The core group – as identified by us – started meeting within the context of CIAM, the international platform for modern architects founded in 1928 and dominated by Le Corbusier and Sigfried Giedion. After the war CIAM became the venue for a new generation of modern architects. As a student, Candilis had already been taking part in the CIAM meetings since the congress in Athens, 1933, while Bakema and Van Eyck had been involved in the discussions on the future of modern architecture since the ‘reunion’ congress in Bridgwater, 1947. Alison and Peter Smithson attended the congress in Hoddesdon in 1951 to hear Le Corbusier speak, and it was there that they met, among others, Candilis, Bakema and Van Eyck. These individuals would form part of the core of Team 10 after the dissolution of CIAM, as would Shadrach Woods and Giancarlo De Carlo. The younger members who instigated the changes in CIAM formed a much wider group than the later core of Team 10. After the eighth congress in Hoddesdon, the individual national groups of CIAM set up ‘youngers’ sections, whose members generally took a highly active part in the organization. The intention was to rejuvenate CIAM, but instead a generation conflict started to dominate the debates, triggering a lengthy process of handing over the control of the CIAM organization to the younger generation. After the tenth congress in Dubrovnik in 1956, organized by a representative group from the younger generation which was nicknamed ‘Team 10’, the revival process of CIAM began to falter, and by 1959 the legendary organization came to an end at a final congress in Otterlo. An independent Team 10 with a partly changed composition subsequently started holding its own meetings without declaring a formal new organization. There is a variety of reasons why Team 10 and its particular core participants emerged from this process. They certainly belonged to the most combatant, outspoken and eloquent ‘youngers’. They also shared a profound distrust of the bureaucratic set-up of the old CIAM organization which they refused to continue. But perhaps more importantly, they were initially part of the most active and dominant CIAM groups, namely those from the UK, France, Italy, the Netherlands and Switzerland, which were run by the second, so-called middle generation of modern architects. This observation partly explains why there are no German participants to the Team 10 discourse in the early years; due to the Second World War most of the first and second generation of modern architects had fled the country to the UK and the USA. This migration also explains the dominance of the Anglo-Saxon contribution to post-war CIAM, which was quite different from the pre-war years, when modern architecture was dominated by developments on the European continent. Especially the English youngers were eager to abandon the CIAM organization and set up their own platform. Situating the history of Team 10 in time raises similar problems to those of establishing the group’s composition. There is no doubt that Team 10 sprang from within CIAM but it is impossible to identify an exact and singular moment of origin; looking back each Team 10 participant seems to remember a different particular moment. The chosen period of 1953-81 represents the years of the most intensive interaction between the core participants. All of them were present in an official capacity for the first time in 1953, at the CIAM congress in Aix-en-Provence, except for De Carlo who first attended a CIAM meeting in 1955 and who did not really form part of the core group of Team 10 until after the dissolution of CIAM. The last ‘official’ Team 10 meeting took place in 1977, but in retrospect the core participants identify the demise of Bakema in 1981 as marking the end of Team 10. With the loss of Bakema as a driving force, the ‘magic’ of the meetings apparently evaporated. At the same time, this was the moment when Van Eyck and the Smithsons became embroiled in a dispute which damaged their formerly close relationship beyond repair. Individual Team 10 members continued to meet, but the core of the group had finally disintegrated. Besides the ambiguous status of the participants and of the group, as well as the time frame, there is a third factor complicating the reconstruction of the history of Team 10. From the perspective of conventional historiography, there is scarcely a tangible product or object to research. The individuals within the group emphatically maintained their autonomous standpoints as demonstrated by the many clashes that arose. Yet they persisted in calling Team 10 a ‘family’, so expressing their close bond and their mutual trust and respect. There was no unequivocal Team 10 theory or school in the traditional sense. There was only one manifesto, the Doorn Manifesto of 1954, and that had been assembled within the older CIAM organization before Team 10 came into being. Even this one manifesto was moreover a subject of dispute between the Dutch and English younger members of CIAM. Mention may be made of two other brief public statements which were sent into the world in 1961 in the aftermath of the dissolution of CIAM – the ‘Paris Statement’ and ‘The Aim of Team 10’. They stated the new group’s intentions to continue to meet, but can hardly be called a programme for a new architecture. According to the introductory text of the Team 10 Primer, the individual members ‘sought each other out, because each has found the help of the others necessary to the development and understanding of their own individual work’. It could be argued that the only ‘product’ of Team 10 as a group was its meetings, at which the participants put up their projects on the wall, and exposed themselves to the ruthless analysis and fierce criticism of their peers. Besides wishing to do as much justice as possible to the history and its dramatis personae, we are concerned with contemporary relevance. Fully documenting the history of Team 10 implies, first of all, broaching the task of exposing the longer, continuous lines of development in the architectural discourse of the latter half of the twentieth century. The questions that occupied Team 10 are still relevant today, even if the answers are now often different. Reconstructing the history of Team 10 is thus an opportunity to present a critical as well as inspirational frame of reference for the issues of today. A first connection to today relates to the issues of modernity, of the ongoing process of modernization, and of how architecture and urbanism deal with these. These issues are, in other words, aspects of the continual process of change to which our living environment is exposed, the indeterminate character of new urban programmes, and the need to allow for spontaneous, unpredictable developments. In Team 10's era these processes took the form of the reconstruction of European cities after the Second World War, the creation of the welfare state and the rise of the consumer society. Today the appreciation and revitalization of the heritage of that era of reconstruction and the welfare state have become acute questions, while the consumer society has entered a new phase subsequent to the decline of the welfare state during the 1970s and the collapse of communism. Among other things this has resulted in the extensive fragmentation of our collective and public space, as well as the continual restructuring and renewal of our cities in response to new economic realities. Team 10 sought, within and parallel to these processes of modernization, concepts and strategies which would make room for individual and collective identities, which would make places capable of being appropriated by residents and users. This standpoint went, for Team 10, hand in hand with an alertness to the specific context of a design task. How to define local and regional qualities, and the potential integration of these qualities into the design, occupied an important place in Team 10's discussions. An alertness to the context implied taking a profound interest in the historical and social dimensions of architecture and urbanism. It led to a fundamental and critical redefinition of modern architecture’s chief premises. This redefinition amounted to both the continuation and the transformation of the tradition of modern architecture. It meant taking a different view of the relationship between the individual and the larger whole; it meant a shift from universal solutions to specific solutions for local situations, and a shift from an outlook on urban planning driven by technological rationalism to one inspired by society and culture; and, finally, it meant the advocating of an inclusive and positive European perspective. This rather ambivalent attitude towards utopianism was probably partly a reaction to their experiences during the Second World War and partly to the rational, technocratic course modern architecture and urbanism were taking in the reconstruction of bombed European cities. Members of Team 10 spoke of the necessity of a ‘new beginning’, and a ‘responsibility’, a moral imperative ‘towards the individual or groups [the architect] builds for, and towards the cohesion and convenience of the collective structure to which they belong’. This was necessary for ‘society’s realization-of-itself’ and for achieving ‘meaningful groupings of buildings . . . Where each building is a live thing and a natural extension of the others. Together they will make places where a man can realize what he wishes to be.’ To Team 10 this implied ‘a working-together-technique where each pays attention to the other and to the whole insofar as he is able’. The myth of Team 10 customarily highlights two moments: the break with CIAM and the rise of postmodernism in the 1970s. This has widely been taken as a convenient simplification – not only by those who have preferred to inter Team 10 in the pages of history, but also by a number of protagonists within Team 10 itself who used this version of the story as a means of inflating the existing differences of opinion to heroic proportions. This obscured much of the overlaps between the various standpoints and the continuous lines of development in the discourse. Reinvestigating the various events and developments, it transpires that a much subtler reading lurks behind the myths of the break with CIAM and the clash with the postmoderns, a reading in which the standpoints are not purely oppositional. The focus on the first of these moments – the break with CIAM – neglects the continued development of the Team 10 discourse after 1962, in particular with regard to Team 10's critique of the welfare state and the rising consumer society, and to the new issues of resident participation and urban renewal. That on the second moment – the rise of postmodernism – misuses the history of Team 10 to sell a new discourse; it disregards the group’s innovations, or misappropriates aspects of the Team 10 discourse as if they were the exclusive achievements of the postmodern tendency in architecture. These aspects concern such topics as regionalism, the establishment of a new and more democratic relation between the resident and the architect, and questions about meaning and identity in architecture; they were central elements in the post-war discourse of modern architecture, with Team 10 as one of its most significant catalysts. The main watershed instigated by postmodernism in its widest sense was that of the end of the grand récits. In parallel with François Lyotard’s analysis of the postmodern condition, Manfredo Tafuri deconstructed the claims of the avant garde in modern arts and architecture in his seminal study Progetto e Utopia). Since then, utopian ideas or belief in necessary progress have been likely to be received with scepticism if not outright rejection. The consequences of this for architecture have included an embracing of the idea of autonomy and a ‘sublime uselessness’, instead of a measure of concern for social issues. This turn in the architectural discourse implied the veiling of the close interaction between everyday practice and moral questions, and the choices that always have to be made in this respect. The resurfacing of the issue of morality and utopian thought in relation to architectural practice is of a recent date. Among others, it is prepared in the studies of modern architecture by Hilde Heynen and by Sarah Williams Goldhagen. The latter’s anthology Anxious Modernisms argues that we should try to identify what she calls ‘the interlocking cultural, political, and social dimensions that together constitute the foundation of modernism in architecture’. In Heynen’s profound study Architecture and Modernity. A Critique and her anthology Back from Utopia, the author arrives at a reconceptualization of the utopian dimension of the Modern Movement. She draws the conclusion that the patent failure of many of modern architecture’s social claims cannot be taken to mean that all social aspirations are necessarily outside the realm of architectural practice. To Heynen, the notion of a Utopia still figures as a critical and energizing factor in the realm of everyday architectural practice. Rem Koolhaas too, the unsurpassed critic of any positivist inclination in architecture, affirmed the necessary link between architectural conception and utopian thought in his latest book Content. One of the very first answers to the dilemmas of postmodern thinking was formulated by Michel Foucault in his lecture ‘On Other Spaces’, in which he suggested the notion of a heterotopia as a parallel to the notion of Utopia. Foucault was all too aware of the repressive dimension that the great ideologies possessed even when they promised liberation and emancipation. Like Utopia, his heterotopia is an ‘other’ place; both are similar to the metaphorical space seen in a mirror which allows us to see our existence with a critical eye. Foucault, probing the mechanisms of power and institutions of discipline, recognized this ‘other space’ in prisons, mental hospitals and schools. Team 10 found their own ‘other spaces’ in everyday situations such as street life in working-class neighbourhoods and the world of children at play. As such this everydayness was not regarded as something idyllic or innocent. Firstly, it was the locus of a different morality, and secondly, it became the locus of a political and social struggle, a contestation of values. Team 10's interest in the street scene and in children’s games was paralleled by an attentiveness to developments in the arts, notably Cobra and the Independent Group, which displayed a similarly alternative or critical stance towards modernization and modernity. The group’s fascination with supposedly spontaneous non-Western lifestyles such as that of the Dogon people or of the impoverished bidonvilles of North Africa should also not go unmentioned. This perspective inspired Team 10 to the indefatigable critique with which they enlivened the architectural discourse. As architects, they attempted to forge a connection between these ‘other spaces’ and their own situation, in a quest for a ‘Utopia of the present’ as they called it – even when this meant risking failure and putting their own standpoints and convictions on the line. It is this ‘other’ perspective that makes the ambivalent connection between the Utopia of the present and the construction of the present into a rewarding entry point to the history of Team 10. Now that Team 10 is indeed history, Team 10 itself might act as a heterotopian mirror – one whose provocative and inspirational power we believe is undiminished, inviting or even compelling us today to become personally involved and to be prepared to explain our own position.